Hello! I am an old member but life has been crazy and I have been gone for quite a while. 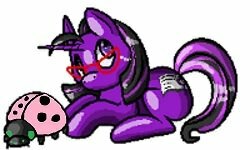 I love ponies from all generations and have collected them since childhood. My favorite pony is Gusty. I'm also a Rainbow Dash fan. I am a photojournalist, and I teach ESL online. I live in South Carolina with my husband, child, two cats, one Pekingese and a bunch of chickens. I'm looking forward to meeting everyone! How wonderful to have you return! I can't wait to hear about all your adventures during your absence! Welcome back, it's been a while Glad to see ya around! Welcome back! I just got back on here after a long hiatus as well. And I have lots of chickens too.